Medichem | DO YOU KNOW WHAT FLOW CHEMISTRY IS? 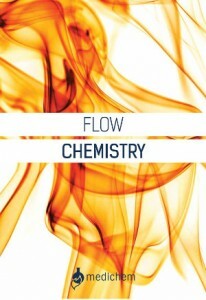 You are here: Home / Articles / DO YOU KNOW WHAT FLOW CHEMISTRY IS? Flow Chemistry is a technique involving the use of structured devices, also called microreactor or flow reactors, where reactants are combined and as a result start reacting. Thus making chemical synthesis a time-resolved process. 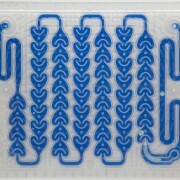 Flow chemistry is a well-established technique for use at a large scale when manufacturing large quantities of a given material. The reactants are pumped through pumps or dosing lines and introduced in a flow reactor device with a given volume. The reaction time, also referred as the residence time, is given by the ratio between total flow rate and channels volume. The ratio between each flow rates gives the reaction stoichiometry. The reactor is generally connected to one or several recirculated baths to control a single or numerous temperature zone. It is characterized by mixing properties and heat exchange properties. Mixing properties depend on various parameters such as channel dimensions, design, hydrodynamics, flow rate and viscosity. Heat exchange rely on material of constructions, dimensions, liquids properties, mixing quality. The dimension of the equipment channels generally vary from several µm range (micro reactors) up to few millimetres (meso-reactors). These reactors can be made by various materials of construction such as polymers, metal, glass; the latter is more widely used in the chemical industry due to its broader chemical resistance, while maintaining good mechanical strength within broad temperature range. It also offers the same transparency as the round bottom flask used in the laboratory, which may be seen useful during process development. In the past years, SiC reactors have also been developed, enhancing their heat exchange performances and expanding their chemical compatibility. Starting in the early 90´s the increasing number of patent and publications has been traducing the growing interest in this area . Even if implementation of these continuous processes in pharmaceutical manufacturing appears slow , today, these flow reactors devices are commercially available since the early lab scale, up to production scale and are widely used to address many chemical reaction [3,4]. These flow reactors are especially beneficial as they offer better mixing and heat exchange performances compared to traditional batch reactors. 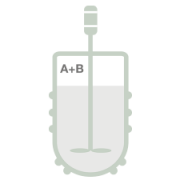 The Mixing quality is a very important characteristic in reactor performance because it precedes reaction. Due to small channel diameters of microreactors, diffusion phenomenon timescale are generally less than 1 second. And depending on the channels pattern design, the ability to efficiently mix reagent flows can be such high that diffusion timescale can be reduced down to milliseconds for multiphase applications, even for meso-reactors with millimetres scale channels . This means that the chemical reaction is then only limited by the inherent reaction kinetic. In many cases, this significant advantage allows a better control on side reaction and impurities formation. In chemical industry, multi-phase applications are generally difficult to scale-up in conventional batch processes as the mixing quality – which is representative of the mass transfer coefficient- generally degrades as the batch vessel size increases. Therefore better consistency of mixing quality at different scale offered by flow reactors opens the door to easier scale-up of such applications. Efficient heat management is one of the key benefits offered by flow reactors. In a chemical process, any deviation of temperature involves changes in reaction rates of the desired reaction and also side reactions. This could have a negative influence on the selectivity. An insufficient heat removal capacity might also become a serious problem when it results in product degradation due to hot spot or even turn to thermal runaway. As a result, efficient heat transfer performances are mandatory for precise temperature control and effective heat management. This becomes especially critical in cases of fast and highly exothermic reactions. Microreactors –due to small channel dimensions – show a much higher surface to volume ratio compared to conventional batches . Therefore the heat generated by the chemical reaction in the process volume will have a large surface to be released. As a consequence, temperature fluctuation or changes that require time to be adjusted at large batch scale are almost immediate at microscale. Resulting in better temperature control and more efficient heat released management for highly exothermic reaction. Highly exothermic chemical reactions can be then operated at higher concentrations, allowing further process intensification and operational cost saving. On top of that, the small hold-up volume of such flow reactors minimizes the impact in case of run away and makes them intrinsically safer compared to big batch vessels. Operating pressure is also an important parameter for chemical processes. By design, channel reactors are generally able to handle much higher pressure compared to batch vessel, as admissible pressure is inversely proportional to the diameter. This opens the door in using broader temperature and pressure range compared to batch process, even under supercritical conditions. Another important parameter of the chemical process is the reaction time. In case of flow reactor it is defined as residence time (average length of time the reacting components stays within the reactor). The inherent advantages of microreactors cited previously allow to considerably reducing the required time to complete the reaction below one minute or even down to seconds. This is highly interesting when running multistep reaction involving hazardous or unstable intermediate (e.g diazonium, organometallics), as the intermediate can be generated in-situ and immediately consumed, hence avoiding accumulation and inventory of such intermediate. In conventional batch equipment, channelling effect, stagnant zones, back mixing, etc. may have an impact on the process performance, such as incomplete conversion, consecutive reaction, undesirable product formation, etc. And the more homogeneous flow pattern within flow reactors (plug flow reactor) significantly attenuates this phenomenon. Thus, a good control of this residence time allows controlling undesired consecutive reactions or product degradation. All of the above-mentioned advantages make flow reactors interesting devices to improve selectivity, process safety, minimize inventory of intermediates, reduce reaction time and further improve process intensification. The pharmaceutical industry is well aware of the potential impact of Continuous processing on their current process. And most large pharma companies are working on developing and implementing continuous processes at various scales. Microreactor is a very powerful tool in development stage as it allows generating a lot of experimental conditions in a raw and in a short time period once, technical hurdle related to precipitation and solid handling, is addressed. However scaling-up microreactor technology to pilot or industrial scale raises new challenges. The upcoming question is “How to maintain the inherent advantages of those microreactors due to channels dimension when moving to a bigger scale?”. In the course of many years, microreactors scale-up approach was the numbering-up . It consisted in optimizing the reaction in one system and then parallelizing the required number of reactor to address the desired throughput. This safe-by design approach is interesting but faced some limitations related to fluid distribution challenges when several tenths or hundreds units would have to be parallelized, and also associated cost. Resulting in it only being reasonable when limited number of units would be required. But today, some equipment manufacturer propose units at pilot and industrial scale with good scale-up rules, maintaining similar performances from lab to production . What´s about Medichem experience in Flow? 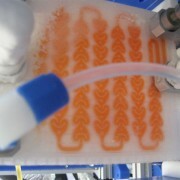 Following scale-up issue faced using conventional equipment on an organo-metallic application. 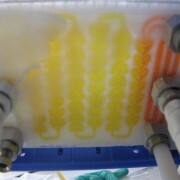 Medichem investigated the use of flow reactor technologies to address this particular point. This step was the opportunity to even shorten the residence time down to few seconds and increase the operating temperature of this cryogenic application compared to the preliminary results. multipurpose production reactor at plant scale. Review on Patents in Microreactor and Micro Process Engineering pp.1-16 Volker Hessel, Christoph Knobloch, Holger Lowe Recent Patents on Chemical Engineering (2008), vol. 1, Iss.1. Continuous Processing in the Manufacture of Active Pharmaceutical Ingredients and Finished Dosage Forms: An Industry Perspective Peter Poechlauer, Julie Manley, Rinus Broxterman, Björn Gregertsen, and Mats Ridemark. Org. Process Res. Dev. (2012), 16, 1586−1590. Flash Chemistry: Fast Organic Synthesis in Microsystems, Jun-ichi Yoshida, Wiley & Sons, (2008). A. Woitalka et al. / Chemical Engineering Science (2014), 116, 1–8. Enabling Continuous-Flow Chemistry in Microstructured Devices for Pharmaceutical and Fine-Chemical Production, Kockmann, N.; Gottsponer, M.; Zimmermann, B.; Roberge, D.M. Chem. Eur. J. (2008), 14, 7470. From laboratory to production: A seamless scale up, J. Jorda, A. Vizza, Spec. Chem. Mag. (2012), 32, 11, 19-21. Medichem: Launch of our new website DID YOU KNOW THAT CHLORHEXIDINE DIGLUCONATE IN ORAL CARE…?